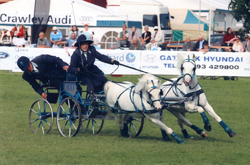 Emvelo Products Ltd announced that they are delighted to be supporting The Orchard Scurry Driving Team for the coming season. "My 33yr old retired show jumper has type 2 diabetes, he "Wee's for England". He is on a wood fibre bedding, I take the wet out (that's most of the bed usually) every one and a half to two weeks, that's the best economy I can get without the bed getting nasty. I mucked him out fully just over a week ago and gave the floor a good spray over with Emvelo Stable+ I then put the new bedding in and sprayed over the surface. Sure enough the Emvelo Stable+, as promised, eliminated the ammonia smell completely and spraying the surface every couple of days has kept the bed odour free. So 100% success achieved on a tough tough challenge. I don't think you could really have given it a more stringent test if you tried." 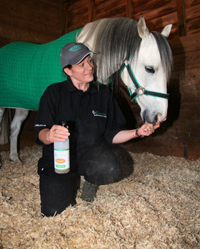 "I am really looking forward to using the spray in my lorry when I have to stay away from home as now I can be confident that I will no longer have to put up with nasty smells drifting through from the horse compartment while I am cooking our tea!!! (I wonder if ponies could talk, would they ask me to spray the living with Emvelo Stable+ so they don't need to put up with the smells we make???)"